I’m sure you can relate to that something you bought and are saving for that special occasion that hasn’t really arrived yet. Your mind probably went straight to that pair of silver high heels or that black, sparkly dress or an unusual statement necklace. Well I’m actually talking about a Gardein Holiday Roast that was I was saving in my freezer! 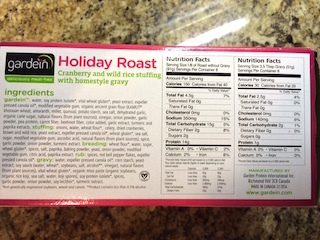 I bought it for the holidays, knowing that I would have it on hand in the freezer, waiting for the perfect time to come out and serve as a wonderful vegan entree. But the need to bring out this beautiful crunchy-crusted roll stuffed with cranberries and wild rice did not present itself all through December. 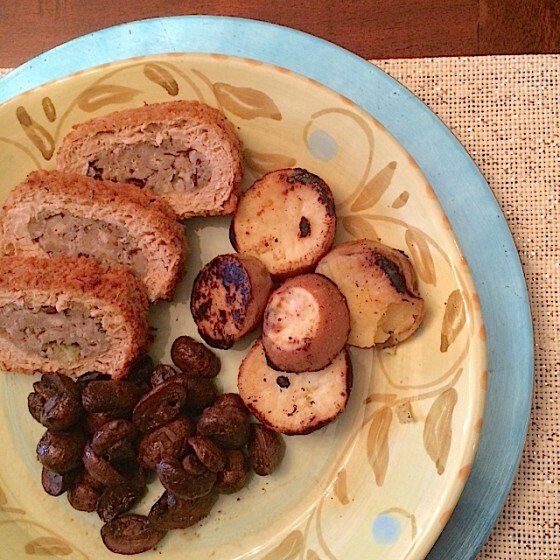 Now that the holidays are over, and we’re well into January, I realized why wait for a holiday or special occasion to make the Gardein Holiday Roast? 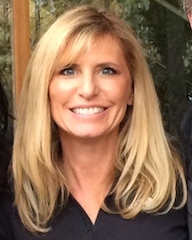 To my husband’s surprise one night, delicious aromas wafted from the kitchen, as the Holiday Roast baked in my oven. I used the “Short On Time” directions listed below and it worked perfectly well. As it cooks, the familiar comforting smell of Thanksgiving stuffing fills the house. 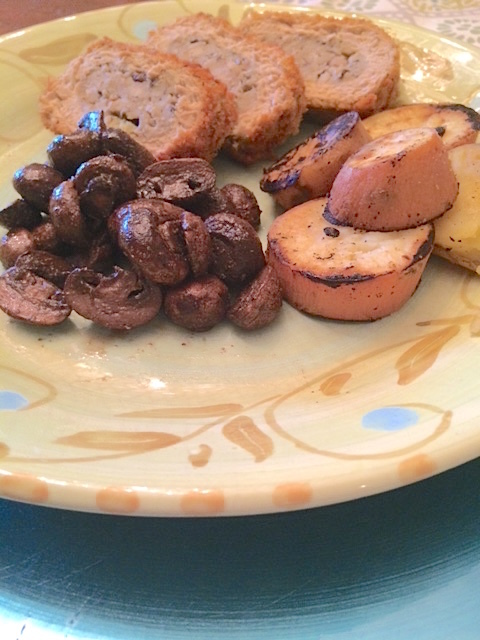 My side dishes were traditional, as I continued on the faux-liday theme: Lemon-splashed Pan-Browned Sliced Yams and Cabernet Tamari Sautéed Baby Bella Mushrooms. Both of these were made without strict recipes, as I like to wing it sometimes, so the basic directions leave room for you own experimentation! Cook from frozen. Do not thaw. Cook for 25-30 minutes until golden brown, crispy and hot throughout. Boil yam slices in salted water until fork can go into them, but not so much to make them too soft and mushy. Take a large frying pan and spray with cooking spray. Heat up the the pan and in it place each slice of yam. Sprinkle with kosher salt and garlic powder and squeeze lemon on the slices. When the cooking side is golden brown, turn over each slice and repeat with the kosher salt, garlic powder and lemon juice. When both sides are as well-done as to your taste, remove and serve. Spray a large frying pan with cooking spray. Heat it up and place all the halved mushrooms in the pan. Allow them to begin cooking and getting golden. Splash tamarin sauce in the pan so that the bottom is covered but the mushrooms are not swimming in tamari. Stir to cover and heat up for a few minutes. As tamari sauce disappears, then splash the red wine in the pan, covering the bottom. Stir and allow the mushrooms to absorb all the wine and tamari. Keep browning the mushrooms until dark and savory. Salt and pepper them to taste. 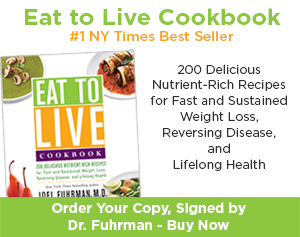 This meal is easy and delicious and impressive! It brings a special feeling to the table on an ordinary night. The next time, I will get a few boxes of Gardein Holiday Roast to keep in the freezer. 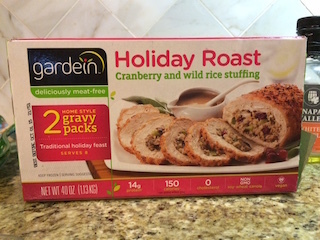 The outside of the roll is crunchy and herbed, the roll itself is great faux turkey and the stuffing has the same flavor and consistency as any holiday stuffing you’ve had, with its nice cranberry, celery and wild rice ingredients. So take out that Gardein Holiday Roast and your silver high heels, sparkly dress and statement necklace that you’re saving for a special occasion! This dish should be made any time for no occasion at all! 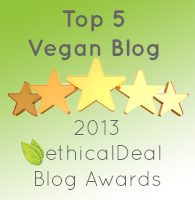 We love Gardein at Vegan American Princess…take a look at some more blog posts!